Apple & Blackcurrant 80 ML E-Liquid 50-50 (VG/PG): A perfectly blended Vape that combines sweet delicious crisp apple and tart blackcurrant flavours. You can adjust your nicotine content to your exact taste by using the optional Nicotine shots. 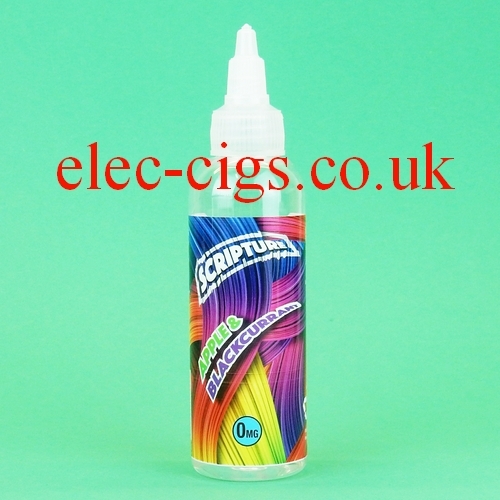 Apple & Blackcurrant 80 ML E-Liquid from Scripture has a well balanced formulation of 50-50 (VG/PG) which allows it to be used in almost every type of e-cigarette and every Dripper/Mod. It is served up in a 100 ML bottle with 80 ML of Zero Nicotine E-Liquid. This Apple & Blackcurrant from Scripture is just one of a vast range of delicious flavours available which can be vaped in any device. Apple & Blackcurrant 80 ML E-Liquid from Scripture: You can choose to add, if desired, one 10 ML Nic-Shot which makes the nicotine content approximately 2.1 mg (0.21%); two 10 ML Nic-Shots will make it approx 4.2 mg (0.42%); three 10 ML Nic-Shots will make it approx 6.3 mg (0.63%) and so on. You can adjust the mixture to your exact taste without limits and you will save money too!!! If you buy one with 3 Nic-Shots you get 110 ML for £16.94 which is only £1.54 per 10 ML. The 10 ML Nicotine Shots provided may vary from the image shown but will always be of the same quality and strength. A superb range proudly manufactured in the UK. Apple & Blackcurrant 80 ML E-Liquid may only be purchased by persons aged 18 years or over. By purchasing this product you confirm that you are of a legal age to do so. If purchased with the optional nicotine shots then this product contains nicotine which is a highly addictive substance.